Historic Structures: Tibbits House 1887? The land that the Tibbits house is on was formerly three different lots. The eastern section (farthest from Main Street) was the site of Benjamin Brainard's Fulton Street store. 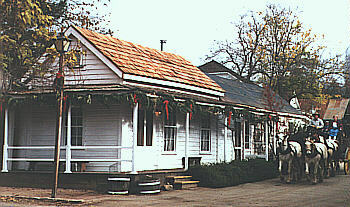 The garden area to the north of the house (toward State Street) was occupied by Brainard's Main Street store, while the western section (at Main Street) was part of the Levy property. Various buildings were constructed and destroyed on these lots from the early 1850's until the late 1880's. The years of construction, type of construction and ownership of these structures is only slightly less complex than Major League Baseball's batting out of order rule. In the spring of 1887, Lyman C. Tibbitts moved his family's house onto this land from its former location on Gold Springs Road. It is unknown when the house was originally built. In fact, it seems that it may actually be two houses that have been joined together. Today, the western portion of the home is used by the Columbia Docents for living history demonstrations. The eastern portion houses the docent library.